2000 - 2007 SUZUKI DR-Z400 DIY (DO-IT-YOURSELF) REPAIR MANUAL * (109 MB) - DOWNLOAD NOW!! 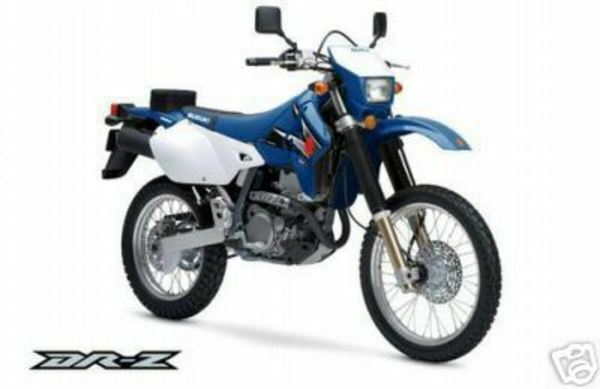 COMPLETE FACTORY SERVICE / REPAIR MANUAL / WORKSHOP MANUAL FOR PRODUCTION YEARS: 2000 2001 2002 2003 2004 2005 2006 & 2007 SUZUKI DR-Z400 DRZ400 00 01 02 03 04 05 06 07 !! 1. Requirements: Adobe PDF Reader & WinZip. Every part of this motorbike is covered!!! Fixing Bad Threads. Torqued it down too much, didnt you. Shop Manuals The Specs for your Engine. Remove Your Seat Fix My Bike ? ? ? I cant even get the seat off. Heres Tips on how to do it. The Ultimate Shop Manual The Specs for the Human Machine. Splitting the CrankCases Split em up right. Hot & Cold How to make a parts Temperature work for you. Torquing Bolts Torque it down. Wow, that sounds dirty, doesnt it! Automatic Clutches Clutch lever? I dont need no clutch lever! A Career in Motorcycle Repair A different view, Thats for sure. Piddling Making it work when you dont know how. Two Stroke Auto-Lube Systems Different Strokes for Different Folks! Engine Start Up Startn her up. HomeWork Every School has homework... Here is yours! Two Stroke Auto-Lube Oil Pumps Lubing er up without fouling er out. engine coolant temperature sensor ECT, camshaft chain and sprockets, intake air temperature IAT sensor, tie rods, includes wheels tires strut, DIY do it yourself, throttle position sensor TPS, compression test, fluid draining, grill, upper control arm, radiator guard, fuel tank, front, capacitor discharge system CDI, fuel level sending unit, transmission switch, taillight work light indicator lamp, TRANSMISSION, drive belt, fan, fender cover, recoil starter, resistor module, differential solenoid electronic throttle control ETC fuses, rear brake pad service replacement, belt alignment, measuring, front bumper, charging system, voltage regualtor, brake bleeding, hub, depressurizing, headlight, circuit breaker, Active Decent Control ELECTRICAL SYSTEM, valve clearance, fuel line fittings, idle air control IAC, poor engine performance, shift selector linkage, ENGINE, fuel pump, contactor, fuel shutoff valve, oil pump priming, throttle body, drive driven clutch, handlebar, thermostat, cylinder head, solenoid, drive shaft, axle CV boot repair, control arm, electronic control module ECM brain, electronic throttle control, battery, ELECTRONIC FUEL INJECTION SYSTEM EFI, cartridge, DC/Ignition, BRAKES, storage box, air filter, ignition timing, water damage, starter, manifold air pressure MAP sensor, front gearcase gear case service, crankcase, front and rear rack rail, intialization and starting, front output shaft, BODY & FRAME seat, alternator, shift shafts, alignment, flywheel and stator plate, disc, electrical system diagnosis, winch, lubrication service, color wiring diagrams FRONT REAR SUSPENSION, MAINTENANCE & TUNE-UP, shift indicator, front and rear master cylinder, clutch tools, Hilliard clutch, rear fender, radiator, tests and adjustments, speedometer, snorkel shaft, carb operation, cooling pump, steering post, throttle cable, oil seal inspection replacement, starting the engine, LUBRICATION, inspection, cooling system service, break in procedure, output shift, footwell, oil pump, brush guard, TROUBLESHOOTING, pressure regulator crankshaft position sensor CPS, transmission service, fluid, stabilizer linkage, FRONT DRIVE, download pdf, CLUTCH & DRIVE BELT, COOLING SYSTEM, camshaft, CARBURETOR, air box, fuel tank vent hose, model identification, valves and components, oil system one-way check valve, spark plug, side panel, exhaust system, fuel rail and injector, fuel system checks, oil change, block and cover, fuel filter and hoses, cargo box, GENERAL INFORMATION, fuel sender, rear brake pedal, speed sensor, hoses and clamps, rocker arm assembly, starting, fastener inspection, spring, electrical system fundamentals, differential gear assembly, shop manual, tools, logic box, clutch drying. FULL VALUE FOR MONEY! BUY WITH CONFIDENCE !! Very good manual. All I need.